1. Shuck your Oysters and keep them on ice. 2. Serve SMS Cocktail Sauce, SMS Mignonette Sauce and horseradish in separate dishes. 3. 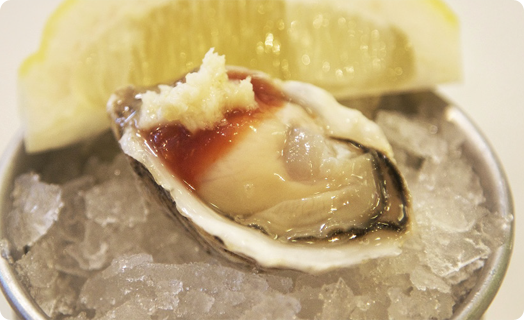 Place a dollop of cocktail sauce, followed by a spritz of horseradish and a small squeeze of lemon juice in on the meat of the Oyster. 4. Place the wide part of the oyster shell (see the “tide tumbled” section in the picture above as a reference) and slurp it down. 5. We recommend enjoying the natural juices in the shell to really get a taste of the ocean. Don’t pour it out!